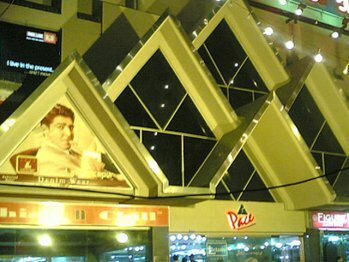 LAHORE – Pace, a shopping plaza located opposite Hafiz Center in main boulevard Gulberg III and owned by late Punjab governor Salman Taaseer is flooded with building map violations, internal encroachments, illegal constructions in the basement allotted for parking and unauthorized shops at emergency exit gates, Pakistan Today has learnt. When the plaza was constructed the second time after being gutted with fire in 2001 extra shops were constructed. As per map, it should have around 200 shops and 12 shopping counters, while now it has 400 shops and 40 counters. The irregularities had earlier been brought into the notice of the Lahore Development Authority (LDA) to take a prompt action but its top guns had ignored the situation. “We wanted to clamp down the infringements and, in this regard, we issued some notices to the Pace management. However, we had to bow down before the political pressure when Taseer was alive,” a senior official of LDA told Pakistan Today. NO EMERGENCY EXIT: Sources in LDA disclosed that ‘alarming’ violation of the building bylaws was the closure of all emergency exit gates. “If the plaza catches fire, faces a terrorist attack, which is formidable challenge these days, or encounters an earthquake, number of casualties will be very high,” sources said. PACE has been reconstructed after a fire broke on 13 September 2001. Sources inside the plaza said that the areas allocated for ensuring people’s access towards emergency gates were no more available as they had been encroached. The cylinder- shape area that leads toward emergency gates had been rented out where palmists were running their businesses, sources maintained. “Back-door stairs with their gates constructed to provide emergency exit are also locked. Space of stairs are being used for stores and tailors shops. The central stairs that go from basement to the 4th floor are hardly used by customers due to numerous encroachments,” sources revealed. ENCROACHMENTS IN THE PARKING LOT: Another official in LDA said that Pace was also full of building bylaws irregularities in the basement, all floors and within the premises of the building. “Around 60 percent of the basement in the Pace allocated for vehicle parking has been encroached. Recently, a grocery shop has been shifted to the basement from the ground floor, further shortening the size of the parking lot. The parking area, built to accommodate more than 200 cars can now contain not more than 50 cars,” he said. He said that Pace management’s office has also been constructed on around 5 marla area in the parking lot, while a small kitchen and a lavatory has also occupied some of the portion, the official said. “Offices for the security staff have also been built in the parking lot, while a sizable canteen has also encroached a big portion of the parking zone. And as there is no check over the irregularities, the nexus of Pace management and Pace union have also constructed a tandoor, a mosque and toilets as well, infringing the rules,” he explained. LIMITED WALKING SPACE: A member of the trade union in Pace said that the height of violation of building bylaws could be assessed by the fact that spaces earmarked for walking ways for the facilitation of customers had also been squeezed to half. He said that Pace management and Pace union have shrunk the walking space in front of shops by constructing shopping counters on the first, second and the fourth floors. Pace management and Pace union have sold and rented out these counters to people who do not know about legalities. Whenever LDA takes action these irregularities, these counters will be demolished and people who purchased these counters from their hard-earned money will be financially destroyed, he said. MORE VIOLATIONS AHEAD: According to a senior official in LDA, as the violations remain unchecked, Pace administration is posing to construct illegal shops at the ground floor as well. A plan is afoot to construct a shop at the one side of shop Number G-31, he said. “Ownership deed reveals that the shop has two side entries (one from the corridor and second from the veranda side). But mall’s administration wanted to close entry from veranda side, as it is going to construct a shop there. As per the building plan, the veranda is an open space and is not allocated for any construction. Against the highhandedness, a stay order was obtained but administration, using its influence, has succeeded in ending the restraining order,” sources disclosed. As per the LDA building bylaws, if any alternations are required in the map of a building, the authority will analyze them and if they will be found damaging the structural strength, proposed alternation will be disallowed. However, Pace’s owner did not seek any permission to bring changes in the plaza. With the massive burden, structural stability has been undermined and if the burden intensifies, plaza may collapse by its own growing load. ‘WE SERVED NOTICES’: LDA spokesman Sohail Janjuwa said that LDA issued notice to Pace manager operation, warning that passageways and corridors should be cleared from all sorts of counters and stalls, built in violation of the approved map. He said that as per the procedural modus operandi, two or three notices will be issued to the violator. Now the last notice will be issued, and if it still remains unnoticed, a legal action will be taken. According to the data available with Pakistan Today, LDA served a notice on July 28, 2010 to Pace management for violations in the building’s master plan. The notice was issued after a complaint was filed on July 19, 2010 in LDA One Window Cell in Johar Town. The notice revealed that all the changes were made in defiance of the set rules and regulations laid down in the Pace’s building plan. The notice said that Pace’s administration should restore the building plan to its original map approved by town planning branch of the LDA. ‘WE DIDN’T DO ANYTHING’: Pace Manager Operation Zaheem Shahid said that issue regarding violations of building plan did not exist at all. “It is out of question that we are involved in map violation,” he said.